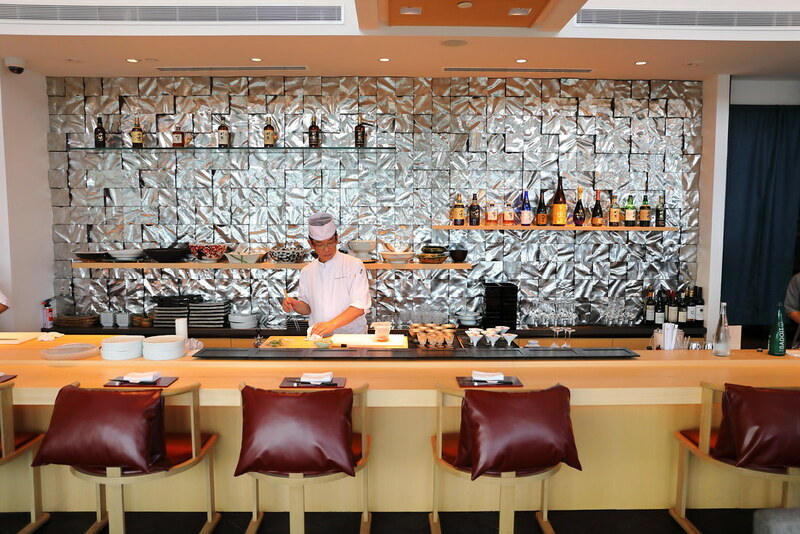 With the recent refurbishment of the tower wing at Shangri La Hotel Singapore, the property has also undergone a change in its F&B establishments with the introduction of the all new Nami Restaurant and Bar on level 24 helmed by Chef Shigeo Akiba who has 30 years of culinary experience under his belt. We had the Omakase ($190) starting with the Appertiser - Assorted Three Types of Seasonal Delicacies. 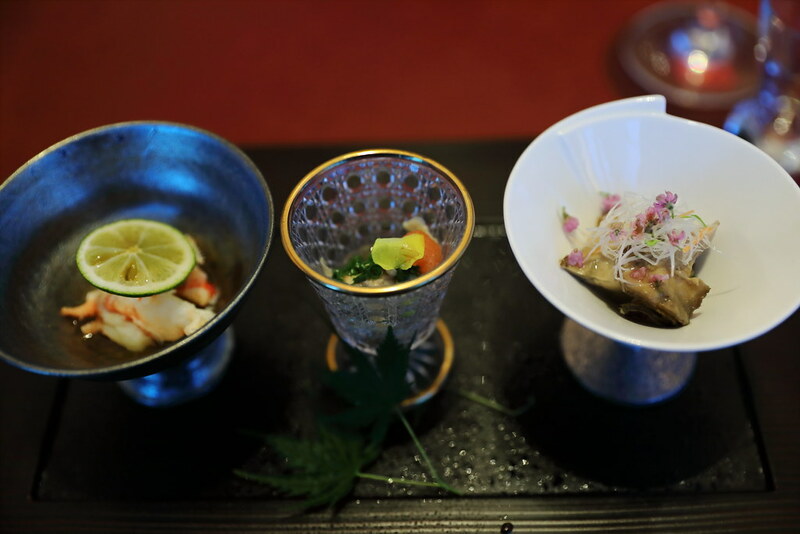 From left to right, we have crab with crab roe sauce, clam with ponzu sauce and lastly oyster with sesame oil. My favourite is the crab for its sweetness and the used of the of the bitter sweet crab roe sauce lifting the whole enjoyment. For the next course, I had the Pike Conger and Sea Uchin in Dashi Soup. 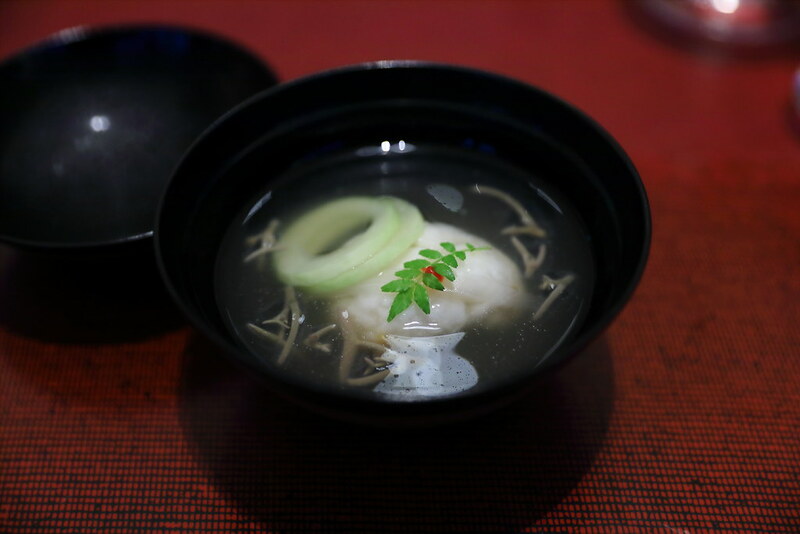 The dashi broth was packed with richness.The ball shaped ingredient in the soup, is actually pike conger (a type of eel) rolled up with sea urchin into a ball. Another interesting ingredient is the water shield which has a slimy coat around a crunchy stem like interior. Accordingly to the staff, the fresh supply of fish at Nami is air flown from Japan Tsukiji fish market 4 times a week. 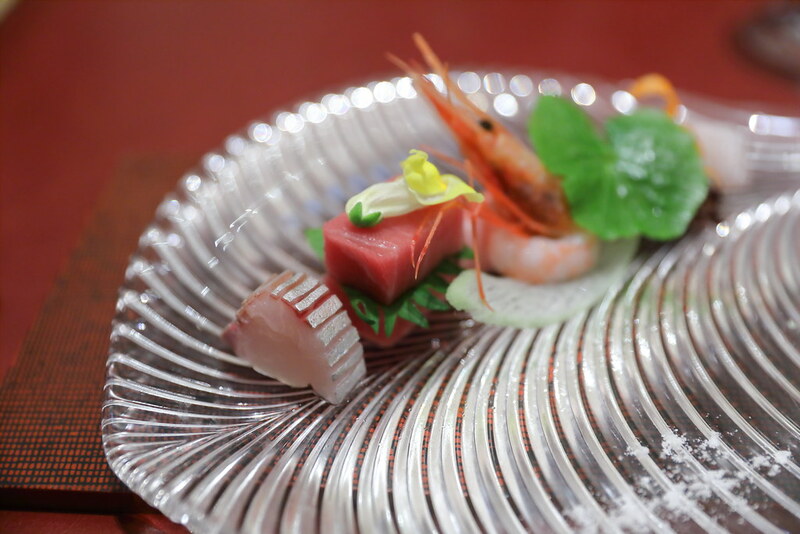 On my plate was a selection of premium Sashimi which consists of mackerel, otoro, ebi, sea bream, snapper and squid with Himalayan salt and freshly grated wasabi. 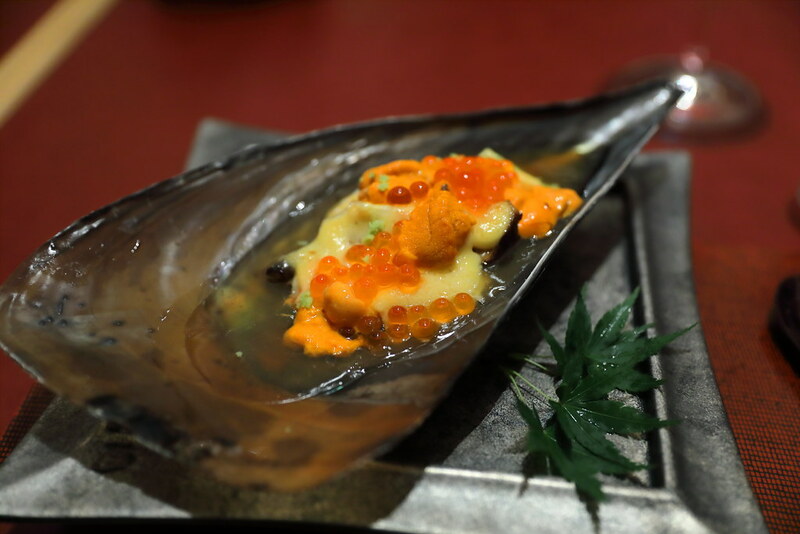 Moving on to the grill, I was served the Miso Penshell Clam with Sea Urchin and Salmon Roe. I am not complaining about the amount of sea urchin I am getting but I think the execution, especially the sweet creamy sauce was too rich for me to fully appreciate the clam. 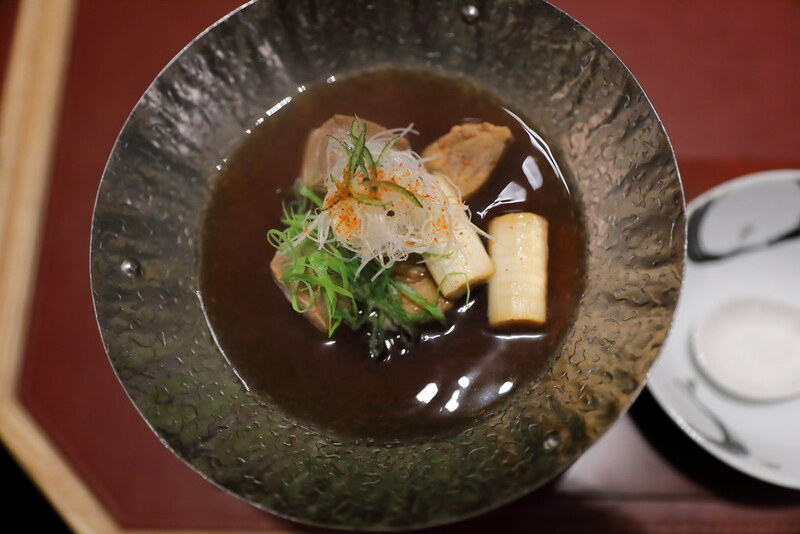 Next I had the Neginma-nabe with the tuna head and leek simmered in a soy sauce base hot pot. The tuna head is chunky and meaty, soaking up the flavours of the broth. Best to have it together with a bowl of rice. 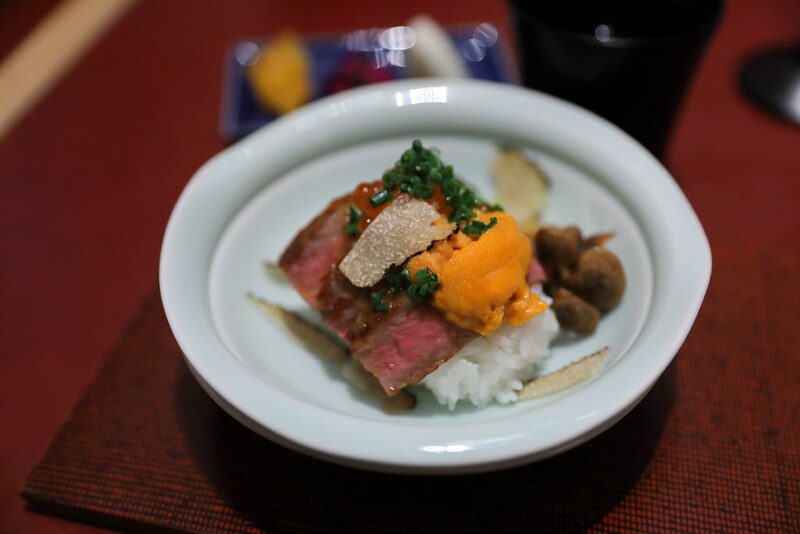 Last but not least is the Japanese Sage Wagyu A4 Sirloin with Truffle on Rice. It also comes with pickles and red miso soup. The melted in the mouth sage beef perfumed by the truffle was simply heavenly. This is crowned by the topping of sea urchin for an unami finish. 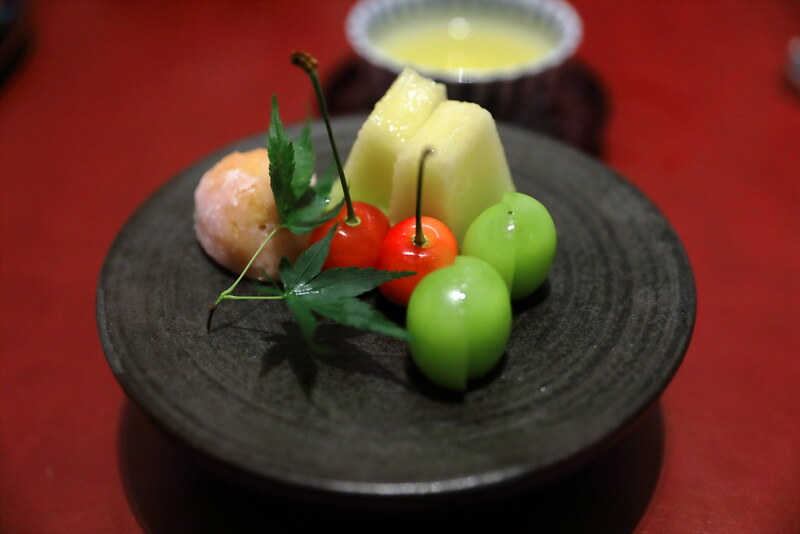 Wrapping up the omakase dinner is the dessert platter what comes with a Cream Cheese Daifuku Mochi and Seasonal Japanese fruits. I perfect ending to a memorable dining experience at the newly opened Nami Restaurant and Bar.